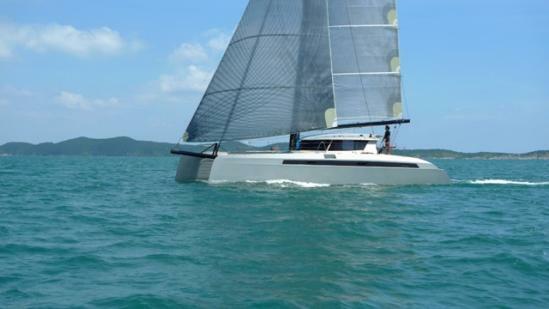 Alibi 54 was always going to be a fast sailing Catamaran. She has also a couple of innovations to make her stand out from the crowd -most notably being the position of the tender under the bridge deck and also the acceptance that this is a required piece of equipment, not an add on like some builders seem to think. Additionally there is the ability to put 400 kilos in aft stability tanks to trim the boat in big following seas or going upwind. Very useful and a great safety asset on such a light boat when the seas get big. Probably nice in a choppy anchorage as well. Interesting video, the boat looks as though she moves well though we question how secure crew would be in rough water -from the film it looks as thought there’s not much keeping them in the boat.